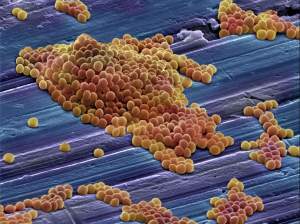 For the first time, researchers have shown how transmission of MRSA from one person to another can be precisely tracked in a hospital setting. The team have developed a remarkable new method that can ‘zoom’ from large-scale inter-continental transmission events to the much finer detail of person-to-person infection of MRSA within a single hospital. To understand better the evolution and global spread of MRSA over several decades and large geographic distances, the team looked at samples from hospitals in North and South America, Europe, Australia and Asia collected over a period of more than twenty years by the CEM/NET Initiative, an international project in molecular epidemiology organized by Instituto de Tecnologia Química e Biológica (ITQB) and The Rockefeller University – and headed by Dr Herminia de Lencastre. For many years, scientists have been searching for improved methods to allow them to distinguish, reliably and within the same species, one bacterial isolate from another. Until now, even the best methods for identifying the differences between bacterial genomes have been unable to differentiate between all isolates – leaving gaps and uncertainties in pathways of transmission. “This new method has allowed us to gain insights into fundamental processes of evolution in S. aureus, one of the most important bacterial pathogens in healthcare in the world,” explains Dr Sharon Peacock, from the Department of Medicine at the University of Cambridge University and the Faculty of Tropical Medicine at Mahidol University, Bangkok, Thailand and an author on the study. “We are now able to discriminate between one strain and another, even where they are very closely related. Our research should inform global surveillance strategies to track the spread of MRSA. This research was supported by the Wellcome Trust, grants from Fundação para a Ciência e Tecnologia, Portugal, Guy’s and St Thomas’ Charity and the Department of Health via the NIHR comprehensive Biomedical Research Centre award to Guy’s & St Thomas’ NHS Foundation Trust in partnership with King’s College London. Department of Biology and Biochemistry, The University of Bath, South Building, Claverton Down, Bath, UK. Centre for Clinical Vaccinology and Tropical Medicine, Nuffield Department of Clinical Medicine, University of Oxford, Oxford, UK. Laboratory of Molecular Genetics, Instituto de Tecnologia Química e Biológica, Universidade Nova de Lisboa, Oeiras, Portugal. Laboratory of Microbiology, The Rockefeller University, New York, USA. Centre for Infection, Department of Cellular & Molecular Medicine, St George’s, University of London, Cranmer Terrace, London, UK. Department of Infectious Diseases, King’s College London, Guy’s, King’s & St Thomas’ Medical School, Guy’s Hospital, London, UK. Directorate of Infection, Guy’s and St Thomas’ NHS Foundation Trust, London, UK.